Voters in New York City went to the polls Sept. 10 to choose the Democratic and Republican nominees for mayor, comptroller and other local races. 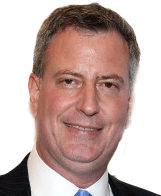 Bill de Blasio leads in the final round of polls for the Democratic mayoral primary, but he needs 40 percent to avoid a runoff. Eliot Spitzer returns to politics after resigning the governorship over a prostitution scandal and is facing off against Manhattan Borough President Scott Stringer for comptroller. Update: Second-place finisher William Thompson conceded the Democratic mayoral primary to Bill de Blasio, averting any chance of a runoff. De Blasio will face Republican nominee Joe Lhota in the general election on Nov. 5. If no candidate gets at least 40 percent of the votes, the top two will move on to a runoff on Oct. 1. Source: New York City Board of Elections. Only contested City Council races are shown. By Aaron Bycoffe, Jay Boice, Andrei Scheinkman and Shane Shifflett.